Panchamirtham (பஞ்சாமிர்தம்) literally means ‘Five nectars’ and it refers to the mixture of five different food items used for divine worship, especially for ‘abhishekam’ (அபிஷேகம்) or ritual bath of the deity. Though different combinations of food items are used to make panchamirtham in different regions, the standard items include banana, dates, sugar candy (கல்கண்டு), jaggery sugar (நாட்டுச் சர்க்கரை) and hill honey (மலைத் தேன்). Palani (பழனி) temple, which is famous for panchamirtham uses ‘kandasari’ (கண்டசாரி) sugar, raisins, ghee, ‘virupachchi’ (விருப்பாச்சி) banana, dates, sugar candy and cardamom. Palani abhisheka panchamirtham (பழனி அபிஷேக பஞ்சாமிர்தம்) has long shelf life without refrigeration and had medicinal properties owing to the composition of Lord Muruga's idol made of ‘navapashanam’ (நவபாஷாணம்). Panchamirtham is also made during festivals and on auspicious days in Indian homes and is served as part of the feast menu. 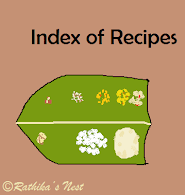 I often prepare panchamirtham using the following recipe, which works well for me. Please try this delicious fruit mix that is tasty and healthy. Method: Peel and chop bananas into small pieces. Chop the dates finely. Mash banana pieces well in a bowl. Add in dates, jaggery sugar and rock candy. Mix very well. Finally add honey and blend the contents together. Allow it to stand for 20-30 minutes. Your panchamirtham is ready! Serve as a dessert or as part of special menu. Note: Panchamirtham tends to become slightly watery on standing owing to the water content of bananas that are usually available in the market. Hence, it is preferable to refrigerate it, if you intend to use panchamirtham after few hours.